Welcome to my tools page. Here you'll find various useful tools and notes for Pre-Production, Production, and Post Production. These pages generate datasheets which can be bookmarked, shared, and printed out for quick reference. If something is aquamarine in color, you can click it and navigate from there. Generates a useful Datasheet for DSMC and DSMC2 style RED Cameras. Generates a Datasheet for a specific RED camera model with information about every Format and Resolution. Compares Image Plane Sizes between two Formats and creates a Crop Factor Datasheet. Generates Datasheets for a selected lens set that provides lens specs as well as Format Coverage for RED Cameras. Calculates footage into to data rates for Uncompressed DPX Image Sequences and Intermediate Codecs like Apple ProRes and Avid DNxHR. Calculates the Optimal Viewing Distance for a given display size. Resolution and Print Size Calculator. Rugged and well thought out filter cases for 4x5.65" filters. A single rod clamp designed uniquely for RED DSMC2 camera bodies. Digital Stocks for RED Cameras for the new IPP2 Color Workflow. Adobe Premiere Pro CC Sequence Presets for RED DSMC2 and DSMC Digital Cinema Cameras. 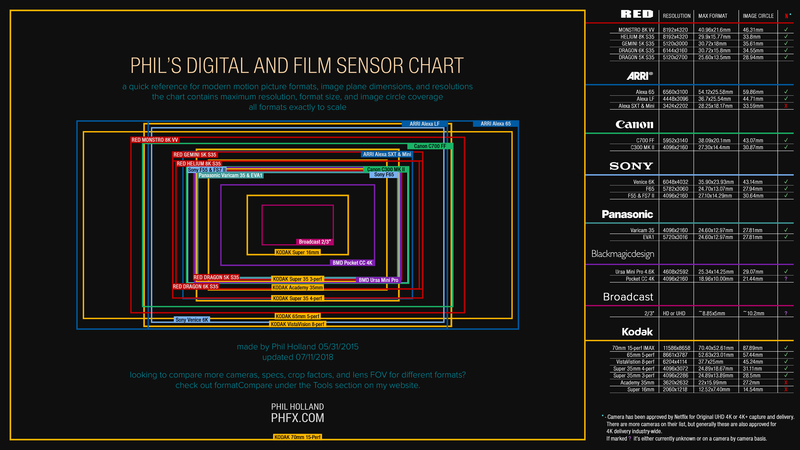 My popular Sensor Chart covering film and digital formats. 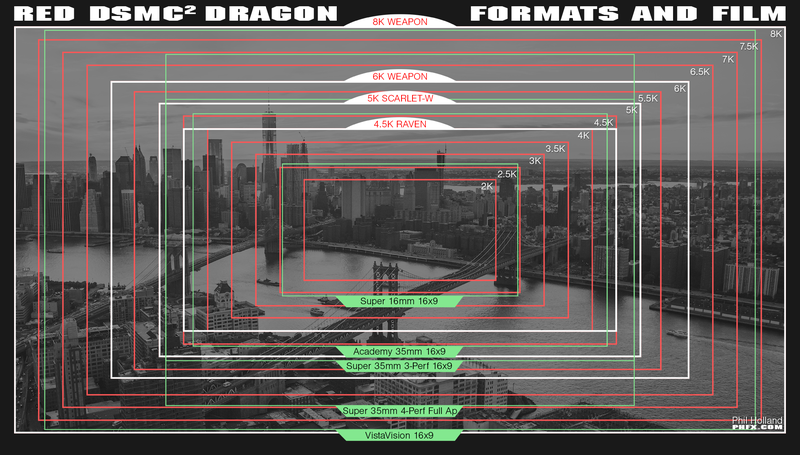 A sensor chart that shows DSMC2 RED Dragon and Helium Sensor Sizes as well as common motion picture film formats. 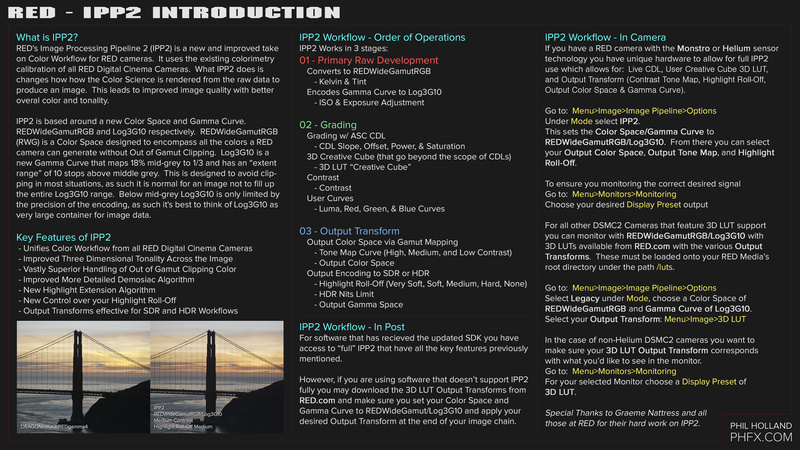 A quick one sheet explaining RED's new Image Processing Pipeline 2 workflow and benefits. 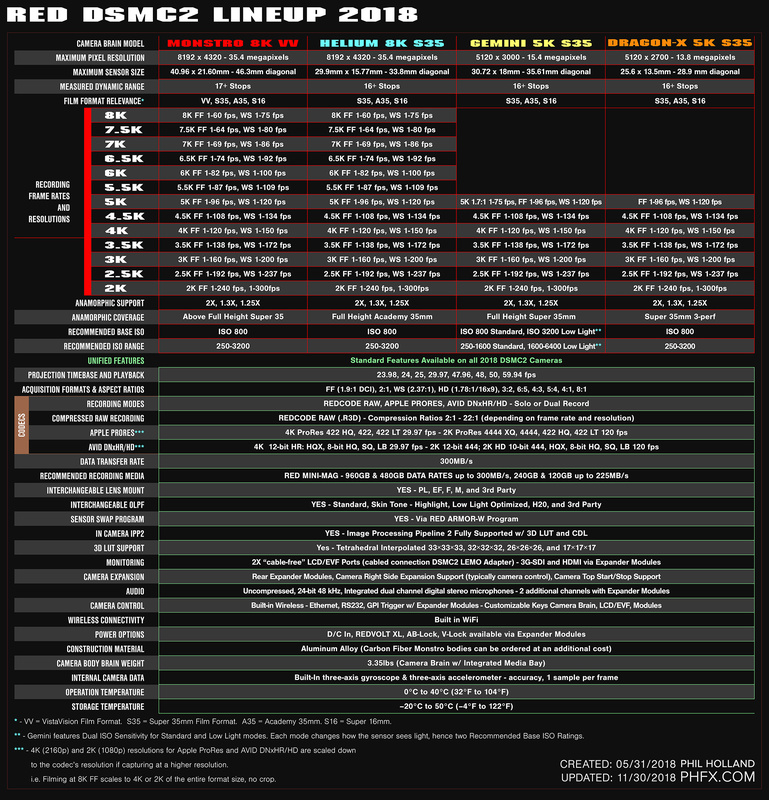 A one sheet listing and comparing features for all current RED DSMC2 camera bodies. 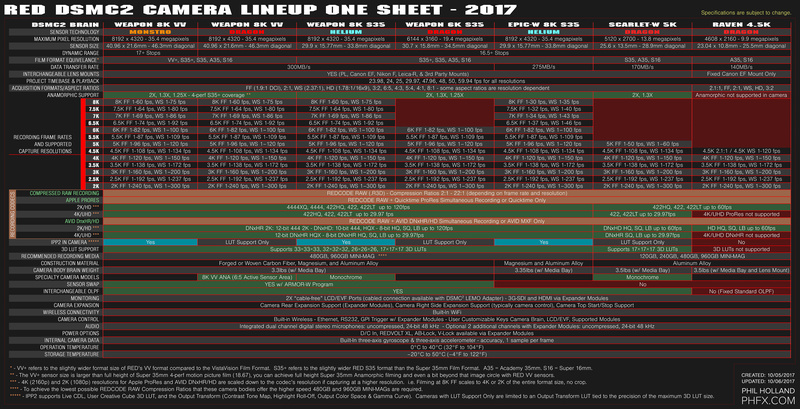 A one sheet listing and comparing features for all 2016/2017 RED DSMC2 camera bodies. 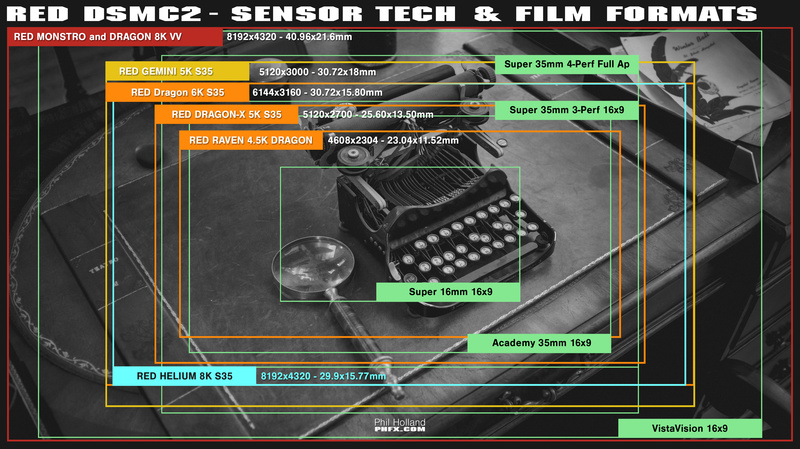 A sensor chart focused on the RED DSMC2 and Panavision Millennium DXL camera bodies with the Dragon Sensor showing up to 8K resolution and format sizes with relevant film formats as well. 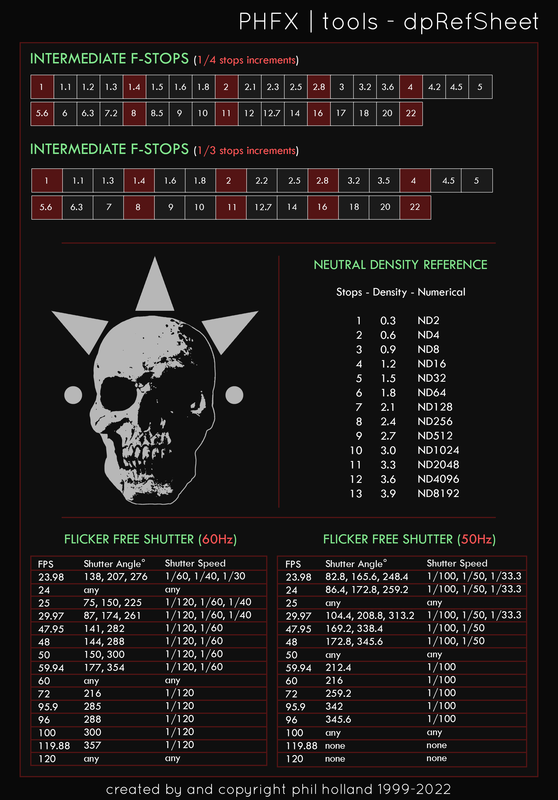 A useful "Cheat Sheet" for Aperture, Shutter Speeds, ND Filter Densities, and Flicker Free Shutter Speeds for 60 and 50 Hz. 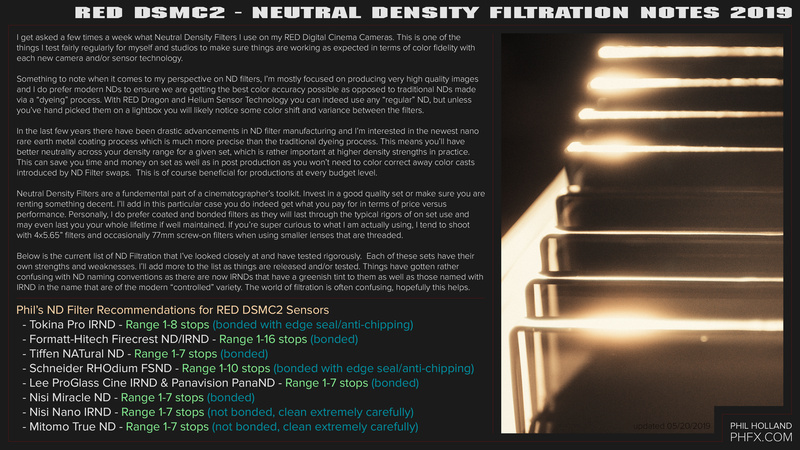 ND Filter Recommendations for RED DSMC2 Cameras. These tools, notes, and tests are made possible by the support of these sponsors.